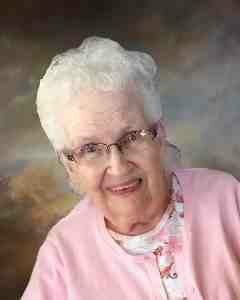 Darlene Louise Tollefson, age 88, of Gaylord, ended her journey here on earth to be with her Savior on Monday, April 8, 2019, at Mayo Clinic Health Systems in Mankato. Funeral Service will be Sunday, April 14, 2019, 2:00 P.M. at the Norwegian Grove Lutheran Church in Sibley Township, Sibley County, Minnesota, with interment in the church cemetery. Visitation will be one hour prior to the service at the church on Sunday. Darlene Louise Tollefson entered this world on April 12, 1930, to Clarence and Louise (Ulrich) Antonsen. She was baptized into God’s family on May 11, 1930, in Hutchinson, Minnesota, and confirmed on April 2, 1944, at Trinity Lutheran Church in rural Gaylord. Darlene’s faith was the most important part of her life and she lived every day in that faith. She received her education in St. Peter, Minnesota. She married the love of her life, Wallace Tollefson on October 3, 1947, and God blessed them with over 71 years of marriage and a faith-filled family of five children, Marcia, Daniel, Janet, Rodney and Karen. Her children blessed her with 12 grandchildren and 16 great grandchildren. She worked various part time jobs, but her passion was raising her children and helping with grandchildren on the family farm south of Gaylord. Darlene was a longtime member of Norwegian Grove Lutheran Church south of Gaylord where she taught Sunday school, was an active member of Ladies’ Aid and in her later years helped with the upkeep of the church. In her heart, as she made the transition from her home on earth to her heavenly home, Darlene found comfort in the following verse of one of her favorite hymns; “Neither life nor death shall ever From the Lord his children sever; Unto them His grace He showeth, and their sorrows all he knoweth.” Darlene ended her journey here on earth to be with her Savior on Monday, April 8, 2019, at Mayo Clinic Health Systems in Mankato at the age of 88 years. Blessed be her memory. Darlene was preceded in death by her Infant Daughter, Kathleen Tollefson; Parents, Clarence and Louise Antonsen; Sister, Joan Busse; and several beloved nieces, nephews and in laws. Darlene and her family members are truly grateful for the kindness shown by the members of Norwegian Grove congregation, Pastor Kyle Madson, neighbors and friends, and the staff of Good Samaritan Home Care. I have known her a long time and she is with God and his angels in heaven right now and I will never forget her especially seeing her in church all the time!! My sympathy to Wallace and family. She was a wonderful lady. May God grant you comfort and peace. Will always remember Darlene’s big smile! My sympathy to the Tollefson family. So sorry to hear the news. Our thoughts and prayers go out to the whole family. My sympathy to you all, and to my friend and classmate, Marcia. May the Lord be your strength at this time. Cheri(Nelson)Birkholz. I’m so sorry to hear of the death of your mother, mother-in-law and grandmother. May God’s peace surround all of you during this difficult time. I will be keeping all of you close to my heart and will be praying for you all to find comfort and peace. Rod and family, so sorry for your loss. Peace and love. So sorry to hear this sad news. Darlene was a wonderful woman, and friend to all. You all have my deepest sympathy. God bless her memory. I’m sorry to hear of Darlene’s passing. I enjoyed talking with her and Wally when I was in Gaylord several years ago. She was a delightful person. May God grant all of you in the family the strength and courage to carry on. We are so sad to hear about Darleen’s passing. We have so many fond memories of going to Wally & Darleen’s farm growing up. We always had such fun there and we always felt loved! Darleen was always joyful and smiling. Thinking of you all and praying for peace and comfort over all the family.